When we refer to projector “throw” we are talking about the distance from the projector to the projection screen. Standard projectors you may have encountered previously often require a considerable distance between the projector and screen to fill the screen. As an example in a small event setting a standard projector will need around 3mt throw to fill a standard 1.8mt (8ft) projection screen. In an event set up this often means the projector needs to be set up in the audience area and cables need to run across the floor to the projector position. Short throw projectors use specials lens’ to reduce the distance required between the projector and screen. 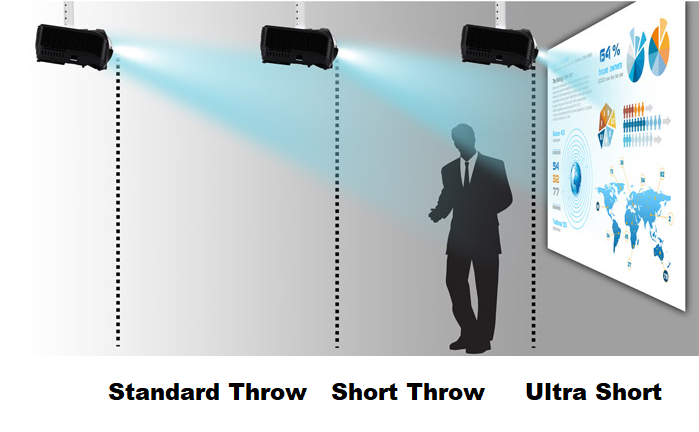 Taking the above example of a small event, using a short throw projector greatly reduces the required distance between projector and screen. Using our Epson short throw projector as an example the required distance is reduced to just 900mm. Advantages of using a short throw projector include the compact nature of the entire set up with minimal throw distance needed, this in turn keeps all cabling needed close to the screen and not out in the audience area. With the reduced throw distance brightness is increased meaning you can use a smaller projector to achieve the same brightness on screen. Our 3000 lumen short throw projectors are bright enough on up to 3mt wide screens with medium level ambient lighting. To set up a short throw projector is similar to most projector set ups although closer attention should be paid to the relative position and angle of the projector to the screen. It is important to ensure that the projector is set up at right angle (90 degree) to the screen as shown in the “top view” diagram below. 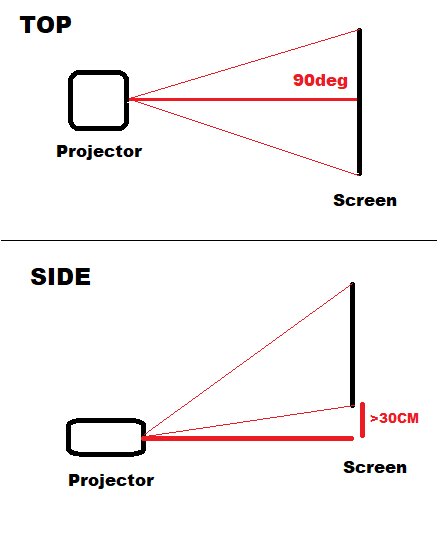 For our 8ft screen the projector should be 30cm lower than the height of the screen as shown in the “side view” diagram below. A step by step guide to setting up the projector and screen package can be found below. Select suitable location for your screen considering best visual position for your audience and impact on guests and any other staff that may need to move around the space (such as catering staff). The projector should now be set up on a platform about 1mt in front of screen and 30cm below the bottom of the screen (depending on the model of projector and screen size). Connect the power and HDMI cable leaving them loose ready for adjustment of position. Pay close attention that the projector faces straight at the screen. Switch on the projector use the zoom feature to fill the screen width, if needed move the projector to a suitable distance to be able to fill the screen. Connect you laptop to the HDMI port and load the software or images you plan to display for your event. Select the HDMI input on the projector source and you should now see your images on screen. Use the projector’s keystone settings to ensure the image is uniform and not warped from top to bottom. Once you have adjusted the keystone if needed you can make final adjustments to the position, zoom and focus settings for best appearance. Finally secure the cables and tidy up paying attention not to knock the projector out of your alignment. When shutting down the projector use the remote control power button and leave the wall power turned on until the projector has fully cooled down before turning wall power off and moving (2 minutes or so). If your looking for a display or audio visual solution for your next event check out our Visual Hire or Projector Hire pages and get in contact with our team at Structured Events.